Spirits were low on Sunday night when the first estimations of the election results came in. 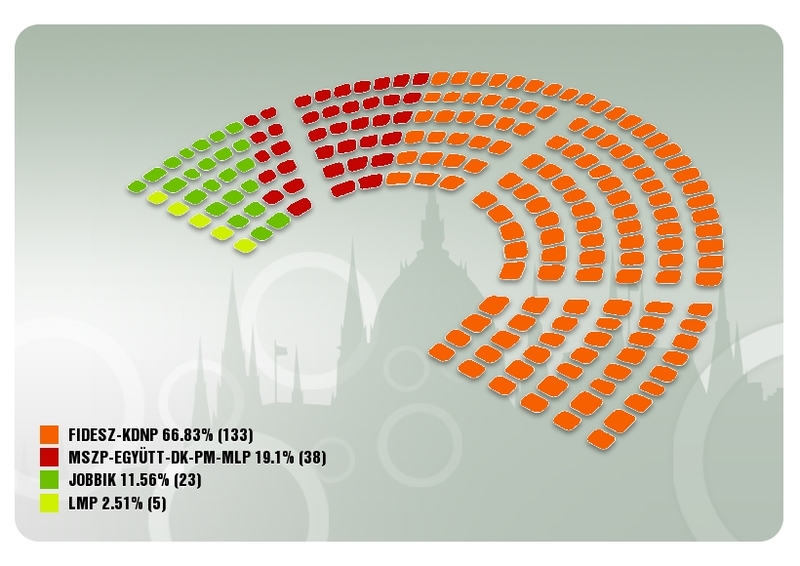 FIDESZ appeared as clear winners, the only question being whether they would gather the 2/3 majority or not. This might define the entire narrative of these elections, especially for the center-left coalition. LeftEast talked to Ágnes Gagyi, Balázs Patkós and Tamás Gerőcs in order to discuss results but also their significance in the long run. The goal was to put these elections in a social and historical perspective and detect some wider social processes beyond the mere electoral numbers. This is a narrative account of the conversation. The results were highly predictable, especially since the new electoral law favored FIDESZ, not only by redrawing the boundaries of the electoral constituencies, but also by re-defining the rules for election funding. By law, civic initiatives, many just cover-ups for the ruling party’s interests, could eschew the regulations governing the electoral parties and thus play the electoral game without being properly part of it. Ultimately, this was a way of funneling money into politics indirectly. Because of these electoral provisions, the entire vote came under scrutiny. The opposition accused the government of tilting the rules in its favor, going as far as to talk about “fraud” before the Election Day. The OSCE, who monitored the elections, made a similar point: while the Election Day was regarded as “transparent”, OSCE considered that the overall electoral process offered an “undue advantage” to the ruling party. Viktor Orbán, in his winning speech, was quick to address the matter and emphasize the fairness of these elections. However, this narrative – which potentially could have been an important one given the size of FIDESZ’s victory – was overshadowed by other narratives that framed the results according to the interpreter’s interests. To FIDESZ and Viktor Orbán this was a clear victory, showing people’s support for their policies. It was interpreted as a legitimation of the strong national leadership within the EU that the Orbán administration displayed in the past four years in power. The election results bolstered even more this stance, determining FIDESZ’s leader to announce his new plan: to reach an American-type of energy prices within the EU. In order to do that, the fight against EU regulations and bureaucracy must be carried on. From this perspective, the issue of the 2/3 majority was not a major issue for FIDESZ and rightly so. FIDESZ appears to be powerful enough in order to be able to be relaxed about this topic. On the other hand, the 2/3 majority might constitute a defining element for the center-left coalition and the way it will frame the election results. Prior to the election, the coalition described FIDESZ’ 2/3 majority as a result of a protest vote, which was supposed to vanish following the experience of FIDESZ in power. The opposition believed that people had given FIDESZ a “blank check” which it had then abused. However, once results started to come in, this narrative was instantly abandoned. Instead, the opposition was forced to accept that these were quite bad results for them, despite their coming in a distant second. Instead of attacking FIDESZ, the opposition leaders seem to be engaged in an internal struggle in order to make the most out of these results and position themselves as the true opposition leaders. 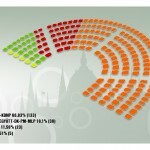 The Socialists, with 29 seats in the parliament, are best placed to do that, with Attila Mesterházy likely to solidify his position as the opposition leader in the long run. Gordon Bajnai, a figure already an eclipsed in the past year, now seems to become increasingly isolated on the political scene. The other figure of the coalition Ferenc Gyurcsány seems to play a more ambiguous role: he still retains the power to be a political deal-breaker and to play an important role in shaping the Socialist’s leadership. With the center-left opposition still in disarray and engaged in internal politicking, Jobbik seems to be on the up. This is so despite the rather pathetic and surprising statements of its leaders who declared that they are disappointed with the election results. With 23 mandates in Parliament, they are the third party in parliament. However, given the fact that Jobbik candidates came second in 42 districts out of 106, the party is on its way to becoming the second biggest party. Without Budapest, their score would be higher. The socialists still have a better political infrastructure across the country. In contrast, Jobbik works through promises and mobilizing language. It seems that these promises start to catch up with them and they will need to deliver. This was evident during these elections, when Jobbik openly appealed to an evanescent middle class. Jobbik’s previous extremist discourse (mainly against Roma and Jews) was left aside in favor of a more moderate vision. Basically, the party simply addressed the fears of the middle classes about things getting worse. Jobbik appeals to a fantasy of a middle class that, in earnest, does not exist. In so doing, Jobbik is becoming a more homogenous party compared to four years ago when the competition for power among more radical groups inside the party was evident. Moreover, it seems that the social base is changing as well: Jobbik seems keen to appeal to disenchanted FIDESZ voters and to the people falling on the wrong side of the government’s redistribution policies. And here we reach one of the most interesting paradoxes of Hungarian politics. Viktor Orbán equates left wing and right-wing radicalism in order to emphasize the centrist, technocratic approach of his party. Jobbik, on its part, tries as hard to distantiate itself not only from FIDESZ as such, but from the Orbán regime more generally. The party is still keen to play the anti-establishment card. They want to preserve a clean image of being outside of the power struggle, out of the parliament games even. However, in the long run, the two parties are inextricably linked. Through its symbolic politics and politically targeted redistribution policies, FIDESZ is gaining some genuine popular support, but at the same time it is actively losing supporters negatively affected by its economic policies. 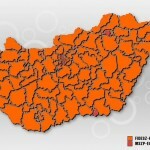 Since FIDESZ is simultaneously appealing both to centrist upper middle classes and the shrinking majority of the Kádárist lower middle class, the balance is hard to keep, especially since policies for the upper middle classes usually entail more losses for those losing their middle class position and for the poor. In order to keep the balance, FIDESZ is forced to resort to nationalism and populism, encouraging an anti-EU and even anti-imperialist rhetoric. But this does not suffice, since in practice, FIDESZ’s policies are harming the lower middle classes as well. It should suffice to note the increase in education costs, which will entail that the middle classes will have to pay more for education, while barring the poor classes from education altogether. As such, FIDESZ has an built in contradiction, which gives it its current strength but will also affect its trajectory in the long run. FIDESZ combines a party-state position that channels both local and European funds and acts as a vehicle towards state power for a national capitalist class in formation. At the same time, FIDESZ crystallized itself as a powerful party with relative autonomy in relation to that national capitalist class. Therefore, FIDESZ acts as a shield for local business, a state-party nexus helping local business by linking it to the EU source of money and by redistributing wealth through state and party channels towards this class. Because it represents the interests of the national capitalists, especially in the context of the intra-capitalist competition at the level of the EU, the party necessarily resorts to a nationalist and even anti-imperial agenda which also appeals to the wider population by fomenting dreams of independence and autonomy in relation to the global capital. But by being a capitalist class party, whose interests it tends to represent and fulfill, the party will necessary alienate some of its core political constituencies, which brought it to power in 2010. This will include not only the destitute working classes that voted FIDESZ against the Socialists, but also large segments of the middle classes who, as mentioned above, will inevitably be on the wrong side of FIDESZ policies. Here, Jobbik will try to capitalize on this disenchantment and will be in the best position to do so, especially through its anti-establishment rhetoric. While the Socialists might win back some of the voters, in the long run, Jobbik seems more likely to capitalize on the overall distaste with established political blocs. The local elections scheduled for this autumn will represent a litmus test for the party. Jobbik is expected to win consistently, especially in the eastern part of the country, offering the party a much needed foothold at the local level and an administrative platform to build on. In this context, it is fair to say that LMP (green party “Politics Can Be Different” – “Lehet Más a Politika”), which got 5 seats into the new parliament, made the most out of the vacuum on the left, but this in itself does not amount to much. LMP, who went through a split when half of the party went to join Gordon Bajnai’s movement, lost much of the appeal it had four years ago and much of its base. It profited from occupying a third position in a context marked by high disillusionment with the established political blocs, but it was always improbable that this position alone would take the Party to the status of a third power in the political game. Two factors seem to have contributed to LMP staying in parliament. First, there were enough people who voted for them on the party lists, even though it is speculative to say who exactly these people were. LMP got 22,000 more votes to their party list than for their individual candidates combined. In contrast, he center-left coalition got 26,000 votes less to their list than for their individual candidates combined. Without these extra votes, LMP couldn’t have made it to the parliament (that’s roughly a difference of 0.5%). It seems that Bajnai and his group will have their own list for the EU election and most probably those people who divided their individual and list votes for LMP, will favor Bajnai in May. Therefore, if LMP loses out during the forthcoming EU elections, it will seriously dent their credibility. 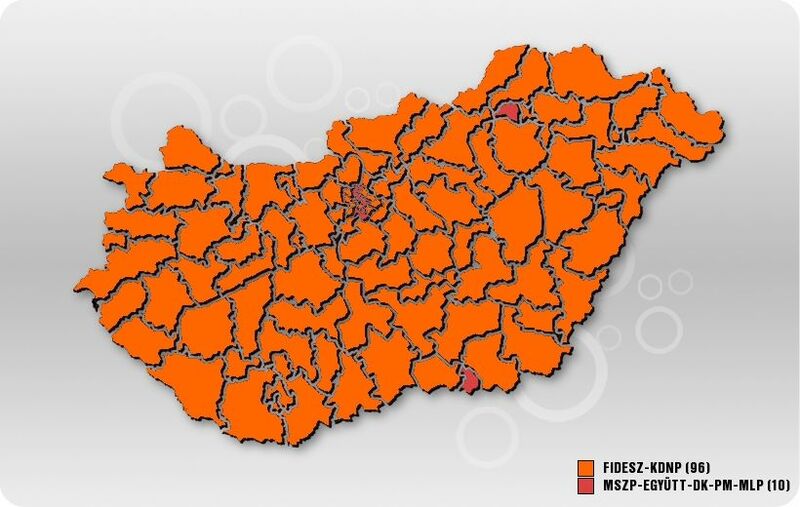 Secondly, there is the theory that says that FIDESZ was no stranger to LMP’s victory. By helping the faction that did not join Bajnaj, FIDESZ was counting on a divided left force, while preserving an air of pluralism in the parliament. LMP did little to alleviate any of these speculations during the campaign. Its messages were totally neutral, emphasizing solely ecological issues while keeping itself at a far distance from more burning social issues. This may have been how they managed to preserve their niche, but at the same time it is what made them largely irrelevant for the wider social struggles going on in Hungary right now. 4K (left party “Fourth Republic” – “Negyedik Köztársaság”) formed as a party precisely as an attempt to fill the void on the left with explicitly social and political messages. For these elections, the party did not gather the required number of signatures that would have enabled it to run. This determined a decision from the party not to run for the EU elections due to be held next month and focus instead on building the movement from below. The failure to gather the signatures dovetailed the need to actively work on building the organizational capacity of the party and to strengthen its capacities as a movement. The party’s main message is that in Hungary there are two oligarchies fighting each other, whereas 4K’s goal is to build the people’s democracy. But this message needs to be carefully delivered. During the preparations for the elections, the party shifted to a rather unexpected message, promising young people that they will legalize marijuana. While the pressure to say something radical was there, there are serious doubts this was the right step. This gesture reflected the structural necessity to address the verynarrow constituency of the liberal urban middle class when lacking resources to build broader class constituencies and alliances. Overall, in the next four years it is highly expected that the same line of politics will continue. An increase of state control and police surveillance will compensate for the downside of the economic policies. Moreover, in the new geopolitical context marked by the rise of Russia in Eastern Europe, the Orbán government might see fit to seek a form of cooperation there, in order to have a better negotiation position within the EU. In this context, the future of the hegemonic class alliance is in doubt, as well as the way the interests of the national capitalists will change. Within the constituency of the former Socialist bloc, the results of these elections came with a sentiment of depression, even though they were far from unexpected. They mark the demise of the symbolic role of EU, something this constituency treated as a transcendental moral force. Things just moved on and Fidesz won, despite EU opposition. Since this time around, 94% of the votes from the ethnic Hungarians living in Romania went to FIDESZ, much to the irritation of Jobbik, it will be interesting to see whether Jobbik will continue its presence in Transylvania or simply concentrate on issues at home. O analiza corecta si echilibrata, cea mai buna care apare in spatiul romanesc chiar daca este in engleza. Desigur, asteptarile stangii / nu se stie de ce/ erau mult peste rezultatele obtinute, discursul mergand chiar pana la ideea posibilitatii de a prelua puterea (forta pentru schimbare). Si cu toate acestea stanga a facut un mare pas inainte, avand in vedere unde era acum 4-5 ani, aproape aneantizata de tensiunile interne si de masurile la care a fost obligata de criza economica. In fond, FIDESZ a scazut fata de acum patru ani aproape cu 10 la suta in conditiile unei scaderi asemanatoare a participarii la vot. Stanga a recastigat jumatate din Budapesta, foarte importanta in economia electorala maghiara, a reusit sa pastreze liberalii in parlament (in Ungaria liberalii sunt de stanga nu de dreapta). Jobbikul nu a reusit saltul sperat de ei si temut de ceilalti, ciclul actual curgand spre o erodare accentuata a dreptei maghiare in conditiile in care ungurii / in mod paradoxal / sunt mult mai rabdatori decat majoritatea vecinilor. Localele fiind peste doi ani, o recucerire a administratiei budapestane si altor orase traditionale de stanga (Pecs, Szeged), poate insemna inceputul unei reechilibrari necesare a politicii maghiare. 2. this analysis could have been written almost word to word 4 years ago. still, the accounting of the irrelevant minutiae of parliamentary politics seems to never get old as the face of hungarian leftist politics stays the same. the nexus of discursive radicality and the naivity of parliamentary influence (we could move to the ethical conversation if the presumption weren’t sinister enough by way of how magnificently ridiculous it is). good thing 4k is working hard to get its message across one joint at a time. who knows, maybe 100 election rounds down the line the radical left will be rewarded with a 4% vote by its built from the top base. well, good thing is the leftists are working hard to get their message through wrapped up in thick useless accademic jargon. It’s important that it was 94% of the ethnic hungarians living in romania WHO ARE SUCKED IN IN NATINALISM ENOUGH TO CARE ABOUT getting a hungarian citizenship, making a festive oath to the hungarian state (with hands on a bible, I guess) in front of a representative of said state….. did vote. Neutrals, leftists and liberals don’t see the use of all this effort jut to get a paper with some red-white-and-green decoration and their name on it (for social security you need an adress, which in itself I don’t see as a problem), so deciding to go vote would have needed from them a much bigger effort. Sorry that I have not registered, but the kind of right-wing people who have already made the citizenship needed much less effort to participate in this election. It’s probably worth mentioning that 4K! did succeed in getting a couple of candidates on the ballot in individual electoral districts, and their results were extremely depressing. In Budapest’s 3rd constituency, the 4K! candidate got 0.5% of the vote; in Budapest’s 13th constituency, the party’s candidate got 0.5% as well; and in the city’s 17th constituency the 4K! candidate got 0.3%. Would they have done better if the party had been able to run a national list? Who knows. But these are not numbers that raise a lot of hope for such prospects. It’s a pity too, I wished them well. I’d guess most potential 4K! voters went to LMP instead, or stayed home. It should be added that the three Budapest’s constituencies where 4K! candidates did end up running were not what one would have immediately pigeonholed as 4K!-friendly parts of the city, and were very different from each other too. These three constituencies covered swathes of the outlying 12th, 16th and 21st districts, respectively – and the 12th is the city’s wealthiest part (Buda Hills), the 16th is largely suburban, and the 21st is the proletarian Csepel island. Then again, the party tried to get their district candidates on the ballot in five other constituencies as well (4, 6, 8, 11 and 15 – another motley crew located in mostly outlying districts, rather than the downtown districts where I’d imagine they’d do best), and apparently didn’t even get enough signatures.